So, for the mother-in-law and myself, I decided on coming home that I would make something that was less “Kiwi: Plain and Not So Tall,” but something that both of us enjoy: ice cream. I’m all about some weird ice cream flavors, and I want to be more about some weird fruit flavors, so I figured I’d start with something I was familiar with in both departments. Therefore, kiwi. Looking for a recipe and not desiring to separate eggs and waste egg whites, I finally came on Sandy’s strawberry gelato recipe on her blog, Eat Real. Sandy hasn’t failed me yet; this recipe was no different. I’ve never made an ice cream without eggs, but this one was quite simple and really forgiving. Cream, milk, sugar, a little cornstarch – simmer, cool, add fruit and churn. Simple, easy, forgiving. Both of these ice creams were a learning experience. The kiwi turned out to be the loveliest pale green (which I’m not sure the pictures do justice). It definitely tasted just like a kiwi – which, I suppose it would – but this batch had a slightly off-flavor that lingered if not eaten “properly.” And by that, I mean keeping the ice cream at the front or the middle of the tongue, not the back where the bitter sensor tastebuds are. 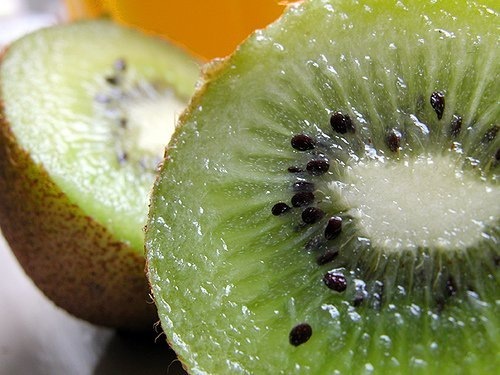 I’m assuming that bitter aftertaste was due to pureeing the kiwifruit, as opposed to mashing it with a pastry cutter or a masher, and consequently blending the seeds as well as the meat. Also, because I rushed this one in my excitement, I didn’t simmer the base nearly as long as I probably should have, being used to egg recipes where you don’t want to overcook the base. Here, you should simmer it for 1-2 minutes over medium heat, uncovered, to get the cornstarch to thicken properly, without leaving the tell-tale film. Eating more than a few spoonfuls of this at a time left a noticeable film on the upper palate and tongue that took several minutes to wash away. Despite all this, I still loved the flavor of the kiwi. Eaten correctly, it was a flash of sour, then sweet, then mellow, all shadowed by that earthiness that you smell when the kiwi is still whole in its skin. Check out Sandy’s recipe for strawberry gelato, now that the weather’s warming up and it’s getting into ice cream season. Although, in my opinion, every season is ice cream season. Even if it’s still cold and unpleasant where you are, make up a batch of exotic ice cream, plop down on the couch in a blanket and imagine yourself on the beach with your tropical treat. You might just have to throw that blanket off and dance in the sun. This entry was posted in Cooking, Food and tagged Dessert, Fruit, Homemade, Icecream by Kate. Bookmark the permalink. Your ice creams sound delicious!! Yay for ice cream season (actually, I agree . . . there’s no such thing as a wrong season for ice cream!)!!! Your comment justmade me realize it’s been a little over a year since I made these! Makes me want to get out the Cuisinart in hone of this post. :) have you seen the salted caramel ice cream over on Brown-Eyed Baker? omg. A must-have. Glad you liked the look of these! Thanks stopping by! Living in the LAND of kiwi, I don’t think I’ve ever seen any kiwifruit ice cream. I suspect for the reason you mentioned. You are more likely to see it in a coulis or simply sliced and served over the top of ice cream. The typical way to eat fresh kiwifruit here is to cut the fruit in half and scoop it out with a spoon. Unless it is really ripe, in which case you squeeze the pulp right into your mouth. If you ever make it Down Under always say kiwifruit instead of kiwi, it’s disturbing to sound like you are eating the national bird! Would sound off to say kiwifruit in the States though. I love a ripe raw kiwifruit, but there’s something about “exotic” fruit ice creams that I just can’t get in the grocery that tempts me into making such things. 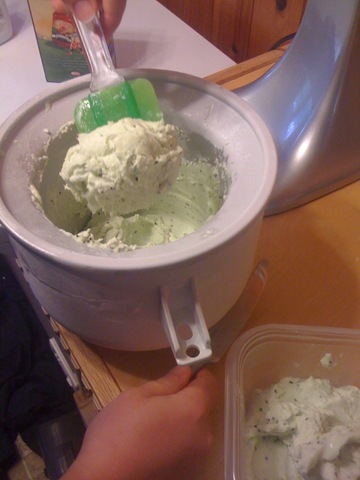 And besides, what’s the point otherwise of having an ice cream maker? I’ll definitely keep the tip in mind, although Stateside I suppose we don’t think about it because we don’t have any kiwi here – just kiwifruits! We do get feijoa ice cream here. Feijoas are Brazilian fruit that for some reason sold in few countries commercially. NZ is one of those countries and feijoas are just coming into season. Yum!